Research That Sparked Anti-vaccination Campaign Called an "Elaborate Fraud"
An article published this month by the British Medical Journal (BMJ) concluded that a controversial 1998 study that suggested a possible link between gastrointestinal disease and the onset of behavioral disorders, including autism, in children following receipt of the measles, mumps, rubella (MMR) vaccine was an “elaborate fraud.” British investigative journalist Brian Deer, who wrote the BMJ article, said the authors of the study, originally published in The Lancet, misrepresented the medical histories of most of the 12 children who participated in the study. He also said that Andrew Wakefield, the British doctor who led the study, profited from its findings. The BMJ article is just the latest evidence discrediting the study that is widely acknowledged as one of the main drivers of an anti-vaccination movement in the UK and abroad. “Study after study after study show that there was no connection [between the MMR vaccine and autism],” says Paul Offit, director of the Vaccine Education Center at the Children’s Hospital of Philadelphia. Last year The Lancet retracted the 1998 study after a medical regulatory panel in the UK determined the authors had acted unethically (see VAX March 2010 Global News). Wakefield was later stripped of his medical license in the UK. In response to the BMJ article, Wakefield released a statement saying that the health problems identified in the children “were not a hoax and that there was no fraud whatsoever.” He also said he did not seek to profit from the findings. Although public health organizations and pediatricians tried to reassure the public that the MMR vaccine is safe for children, immunization rates in the UK plummeted after The Lancet study. In 1997, the year before The Lancet study was published, 91% of children in the UK were vaccinated. In 2003, the rate had dropped significantly in some parts of the country. “There were certain sections of London where fewer than 50% of the population were immunized,” says Offit. The decline in vaccination rates extends well beyond the UK. Last year, the US Centers for Disease Control and Prevention reported at a pediatrics conference in Vancouver that the percentage of American parents who refused or delayed vaccination doses had increased from 22% in 2003 to 39% in 2008. Fears about adverse events from vaccines also led to a 10% drop in vaccination rates in the Ukraine between May 2008 and March 2009, according to the United Nations Children’s Fund. And when vaccination rates lapse, it can have dire, even deadly consequences. “We are now seeing outbreaks of infectious diseases that we hadn’t seen before, not at this level,” says Offit, whose new book, “Deadly Choices: How the Anti-Vaccine Movement Threatens Us All,” details the history of the modern anti-vaccine movement and its consequences. Offit notes, for instance, that in 2010, California experienced the worst outbreak of pertussis (whooping cough) since 1947. California health authorities have reported nearly 9,000 confirmed, probable, or suspected cases since Jan. 1, 2010, and 10 deaths. A new vaccine called MenAfriVac that could potentially eliminate meningococcal meningitis in 25 African countries was rolled out late last year by the Meningitis Vaccine Project (MVP), a partnership between the World Health Organization and PATH, a non-profit global health organization based in Seattle. A vaccination campaign was launched in the western African countries of Burkina Faso, Mali, and Niger, with neighboring countries soon to follow, according to the Bill & Melinda Gates Foundation, a major backer of MVP. The vaccine was developed to combat the group A strain of meningitis—the most common strain of meningitis in Africa—and when fully implemented will reach an estimated 12.5 million Africans, according to Marc LaForce, the director of the Geneva-based MVP. “Africa is the only place on Earth that continues to have these impressively large outbreaks of group A meningitis,” he says, adding that an estimated 450 million Africans are at risk of contracting group A meningitis. Epidemics occur every seven to 14 years on the continent. In 2009, a seasonal outbreak of meningitis cutting across portions of sub-Saharan Africa infected 88,000 people and resulted in more than 5,000 deaths. LaForce compares the logistics required to carry out the massive vaccination campaign to the invasion of Normandy. “Over a couple of weeks more than 11,000 vaccinators in three different countries will be administering vaccines to 12.5 million people,” he says. MenAfriVac, which health authorities have held up as a standard for the future of global vaccine development, is based on an older meningitis vaccine that offered short-lived protection coupled with a protein from the tetanus vaccine that produces a more potent immune response. The vaccine was manufactured by the Serum Institute in India at a cost of around US$50 million and is being distributed at a cost of less than 50 cents a dose. Antibodies are one of the main ways the body defends itself against invading pathogens. These infection-fighting proteins can bind to viruses and inactivate them. Antibodies are also thought to be essential to the protection afforded by most, if not all, existing vaccines. In recent months, researchers have isolated several antibodies from the blood of HIV-infected individuals that are able to inactivate or neutralize a high percentage of HIV strains in laboratory tests (see VAX March 2010 Primer onUnderstanding Advances in the Search for Antibodies Against HIV). These antibodies are referred to as broadly neutralizing antibodies. Some of these antibodies can even neutralize HIV at very low concentrations, suggesting they are quite potent. The goal now for AIDS vaccine researchers is to try to design vaccine candidates that can coax the body’s immune system to make similar potent, broadly neutralizing antibodies against HIV. Although this is a daunting task, researchers are making considerable progress in understanding how these broadly neutralizing antibodies evolve in HIV-infected individuals. There are many components of the immune system that play a role in fending off viruses. Antibodies are made by a type of immune cell produced in the bone marrow that are referred to as B cells. Millions of different versions of B cells exist. These B cells become activated when they come in contact with foreign pathogens, such as HIV. 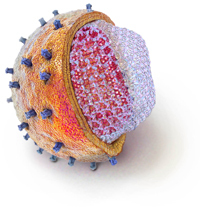 This triggers the B cell to become a plasma cell that is able to produce antibodies that are specific to HIV. Although many HIV-specific antibodies are produced, not all of them are capable of binding to HIV and neutralizing it (see VAX February 2007 Primer on Understanding Neutralizing Antibodies). Once B cells bind to HIV, they start to multiply. As they multiply, the B cells begin to mutate or change their genes. Some of these genetic mutations in the B cells result in the production of antibodies that are better able to bind to HIV. These superior B cells then multiply again and again, triggering additional mutations. With each cycle of mutation and differentiation, the resulting antibodies are said to become more mature. The more mature the antibodies become, the better they are. This process is referred to as affinity maturation. After researchers isolated the most recent broadly neutralizing antibodies against HIV, they began studying the characteristics of these antibodies and they found that they had gone through the process of affinity maturation many times, which is to say that they had accumulated many mutations. Studies have shown that all of the HIV-specific antibodies identified so far are highly affinity matured. In fact, these antibodies have accumulated many more mutations than other antibodies that have been studied. Researchers do not yet know if all of these mutations are necessary for these antibodies to neutralize many different strains of HIV so well. But in some cases, studies have shown that reversing most of the mutations resulted in an antibody that could not neutralize HIV, suggesting at least some of the mutations are required. To further study how broadly neutralizing antibodies evolve in HIV-infected individuals, researchers are going back to one of the original donors from whom some of the recent broadly neutralizing antibodies were isolated to isolate many other antibodies from their blood samples. This way they can identify and study the precursors to the broadly neutralizing antibodies and determine the path of evolution those antibodies had taken, much like constructing a family tree. This information will likely be useful to researchers as they try to develop vaccine candidates that can induce similar broadly neutralizing antibodies.